The 4th Bimstec summit is being held in Kathmandu after a lapse of four years. For the Bimstec that celebrated 20 years in 2017, four summits in 20 years is not certainly a time for celebration. 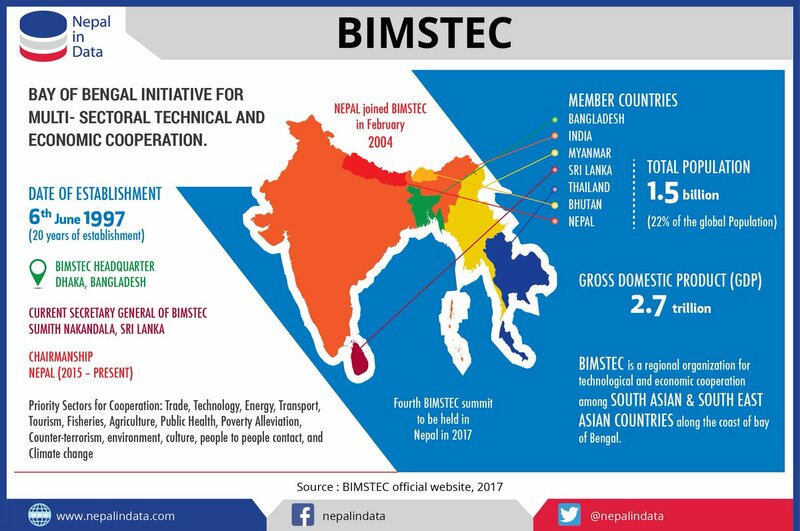 Bimstec has been struggling to take off since its inception as its member states were members of several other regional organisations that were seen as viable at that point of time. Many analysts link this sudden emphasis on Bimstec to the failure of Kathmandu Saarc summit to conclude the much-awaited Saarc Motor Vehicle Agreement (MVA) and later cancellation of Islamabad summit for political reasons. Before the Saarc MVA was proposed, the connectivity network in eastern South Asia was already being put in place. India was already engaged in several bilateral connectivity projects with Nepal, Bhutan, Bangladesh, Myanmar and the trilateral highway between India, Thailand and Myanmar. These countries also signed the Asian railway and road connectivity network. The prospect for Bimstec should lie in not replicating Saarc or including each and everything from human development to security in its agenda. The bulkiness of its agenda, consisting of 14 sectors, would not allow the organisation to be effective in terms of delivering or in terms of transforming itself to a vibrant goal-oriented organisation. The organisation has to focus on a cluster of identified agendas rather than take each agenda as separate. For example, the agenda of trade and investment, transport and communication, and energy cooperation should be looked as a unified whole as trade and investment would suffer without connectivity and electricity. Similarly, cooperation on security should combine counter-terrorism and transnational crimes, cyber security, environment, ecology and disaster management. People-to-people contact needs to be combined with tourism and cultural cooperation. All these identified areas of cooperation are interlinked. Therefore, there is a need for members responsible for a particular area of cooperation identified in the Bimstec agenda to bring in necessary synergy to make progress on a particular cluster as identified above. Bimstec needs to learn from the weaknesses of Saarc. First would be not to bring each and every municipal agenda to the ambit of cooperation within Bimstec. Saarc brought into agenda many issues. It became overambitious in its agenda including agendas related to the girl child, poverty and terrorism. The large set of agendas made Saarc not focus on anything seriously to showcase its achievements. Second, Bimstec needs to make its achievements public or bring out a status paper on its various initiatives every two years and identify the bottlenecks to flag the failure of a particular country to come on board rather than making its failure reach an agreement as an institutional failure where no one takes responsibility. Bimstec’s Secretariat needs to be strengthened which should have an officer from the member country posted for three years. Strengthening of the Secretariat needs to be backed by strong political will to take this cooperation mechanism forward. 1. India, the largest member of the grouping, has often been criticised for not providing a strong leadership to BIMSTEC. 2. Both Thailand and Myanmar are criticised for having ignored BIMSTEC in favour of ASEAN. 3. Absence of a permanent secretariat for a long time and lack of commitment to invest in several priority areas identified by the member states were seen as some of the key institutional factors holding the BIMSTEC back. 4. The ‘noodle bowl effect’ of regionalism too was at work as formation of another sub-regional initiative, the Bangladesh-China-India-Myanmar (BCIM) Forum, with the proactive membership of China, created more doubts about the exclusive potential of BIMSTEC. Previous postSaturday dose of motivation for better Monday!